Aims: The RELAX-OAB study is designed to confirm the safety, efficacy, and technical performance of the Axonics r-SNM System, a miniaturized, rechargeable SNM system approved in Europe and Canada for the treatment of bladder and bowel dysfunction. 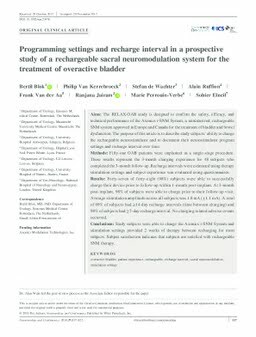 The purpose of this article is to describe study subjects’ ability to charge the rechargeable neurostimulator and to document their neurostimulator program settings and recharge interval over time. Methods: Fifty-one OAB patients were implanted in a single-stage procedure. These results represent the 3-month charging experience for 48 subjects who completed the 3-month follow-up. Recharge intervals were estimated using therapy stimulation settings and subject experience was evaluated using questionnaires. Results: Forty-seven of forty-eight (98%) subjects were able to successfully charge their device prior to follow-up within 1-month post-implant. At 3-month post-implant, 98% of subjects were able to charge prior to their follow-up visit. Average stimulation amplitude across all subjects was 1.8 mA (±1.1 mA). A total of 69% of subjects had ≥14-day recharge intervals (time between charging) and 98% of subjects had ≥7-day recharge interval. No charging related adverse events occurred. Conclusions: Study subjects were able to charge the Axonics r-SNM System and stimulation settings provided 2 weeks of therapy between recharging for most subjects. Subject satisfaction indicates that subjects are satisfied with rechargeable SNM therapy.